SportMaster® is a premium brand of sport surfacing and repair products. Our 100% acrylic formulations are balanced to produce a premium quality result, with easy mixing and application characteristics. We use only the best acrylic resins and quality pigments to achieve durable and vibrant surfaces for professional, recreational, and residential installations throughout the world. We supply and support tennis court builders and resurfacing professionals throughout the world. 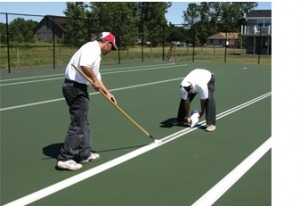 From color coatings and tennis court crack fillers to mixing equipment and tools, SealMaster is your one-stop-shop for sport surfacing materials. Our complete SportMaster website has additional information and tools, specific to the SportMaster line of products and the sports industry.